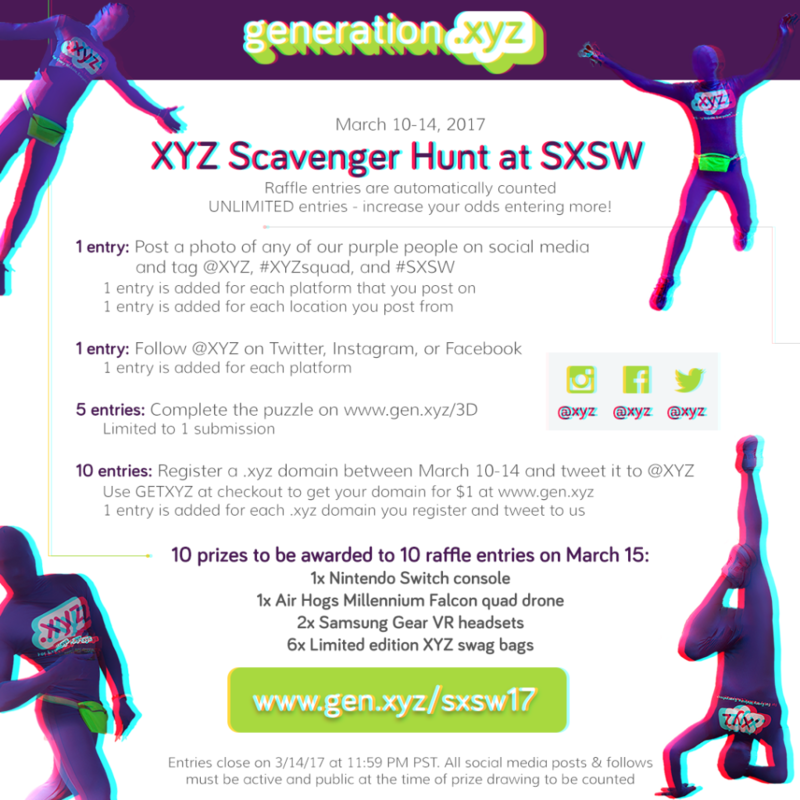 Find the #XYZsquad at SXSW for your chance to win a Nintendo Switch, Samsung VR headset, drone, & more! The #XYZsquad joins the XYZ Team in Austin today for our biggest SXSW yet. Last year, these purple people were breakdancing and parkouring all over Austin to make our XYZ 3D glasses the fashion hit of the week. This year, we’re not only passing out 3D glasses, but we’re also raffling off the latest and greatest by Samsung VR, Nintendo, and Star Wars in our XYZ Scavenger Hunt. It’s free to enter, and all you need to do is find any of our countless purple people hanging out in Downtown Austin! By entering this contest held by Generation.XYZ LLC (“Company”) you agree to abide by the rules above and the following terms. No purchase necessary. Making a purchase will not increase your chances of winning a prize. You must be 18 or older and a US resident to take part. Keep your social media contact information current. Winners chosen at random among eligible entries. A winner will be disqualified if the winner cannot be reached after a reasonable amount of time. If we cannot contact you via your social media account, you forfeit your winner’s status. We reserve the right to cancel or modify the contest at any time for any reason with or without prior notice. Prizes are offered “as is” with no warranties whatsoever. Prized will be mailed to winners free of charge. Use of any fraudulent means to enter the contest will result in disqualification. Acceptance of a prize constitutes permission to use the winner’s name and social media profile for promotional purposes. Sole and final judgement as to all matters related to this contest are at the sole discretion of Company. Prized will be mailed to winners at no charge. You represent and warrant that your social media page and content does not violate any applicable law or the rights of any third-parties. You agree to hold Company and its affiliated companies not liable for any claims, injuries or losses of any kind related to this contest.